The mayor of one of our key sister cities is making his annual stop in San Jose and will be participating in a special Irish-themed bike party tomorrow--Irish music and all. Everyone is welcome! They will meet at San Jose City Plaza at 9:30 AM (don't forget to change your clocks) and ride on a 7-mile route through Downtown that will show off new bikeways and bike share stations. 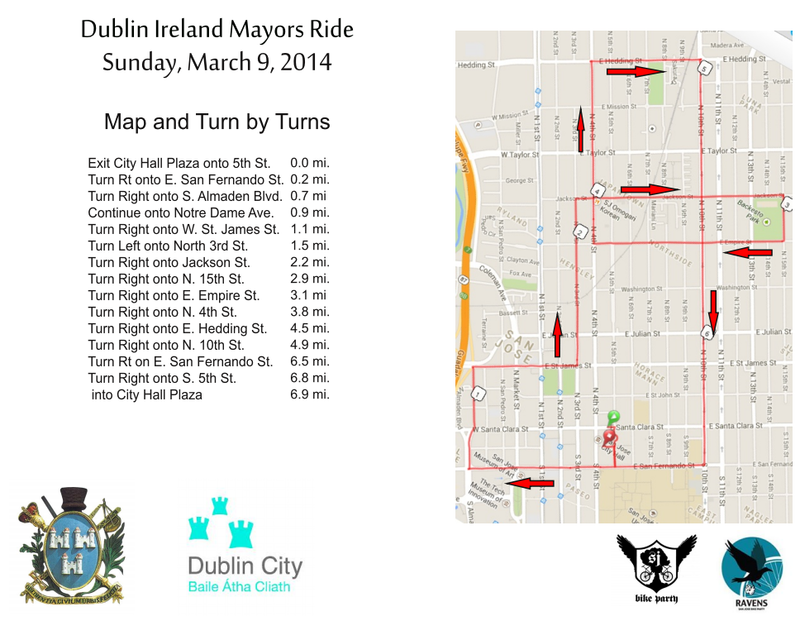 Check out the route and the press release below and don't forget to grab a Guinness after the event. As part of the Sister City relationship between the cities of Dublin and San Jose, the Lord Mayor of Dublin will be making his annual stop in the Silicon Valley. 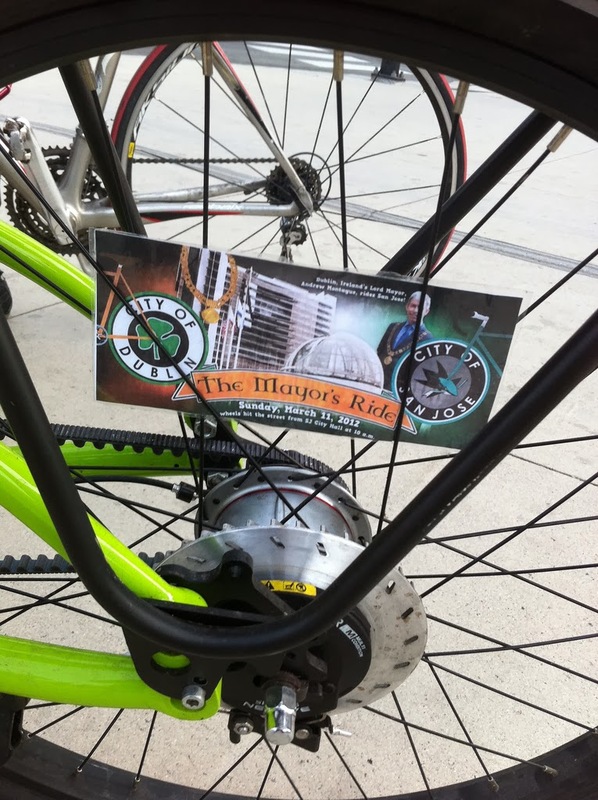 The Lord Mayor will ride with San Jose Bike Party and local residents for a Sunday morning of cycling, music, and fun. San Jose’s cycling and creative community will be featuring Guerillaz in Da Mixx synchronized music bikes with a playlist consisting of traditional Irish tunes and Bike Party favorites. Lord Mayor Oisín Quinn is the 344th Lord Mayor of the city of Dublin and has been a city councilmember since 2004. Next year the city of Dublin will celebrate the 350th anniversary of the city’s first Lord Mayor. Visible on the Lord Mayor at all public events is the Great Chain of Office which was presented by King William III (William of Orange) in 1698. The Chain is worn at all official ceremonies and is composed of decorative links including the Tudor rose, a harp, a trefoil shaped knot and the letter S (thought to stand for Seneschal or Steward). We will meet at San Jose City Plaza at 9:30AM PDT (don’t forget to set your clock forward by one hour the night before) and ride on a route of about 7 miles. We will be visiting some of the city’s downtown landmarks and recent bikeway improvements, including bike share stations, green bikeways, and newly placed bike corrals or on-street bike parking facilities. A map of the complete route will be available at SanJoseBikeParty.com two days before the ride. Everyone is welcome to attend or participate. More information on the organization, including details on future rides, is available atwww.sjbikeparty.org. San Jose Bike Party is a late evening ride around the Bay Area’s largest city; with different routes and start points. We ride as one cycling group on the 3rd Friday of every month. Weather does not cancel the ride. San Jose’s biking community, much like the city itself, has grown rapidly, and San Jose Bike Party’s goal is to be a positive part of this growth. Each month, the event sets out to explore the city via bicycle, featuring an ever-changing route, new playlists for the ride, and regroups that encourage participants to socialize with others. San Jose Bike Party is a monthly happening which encourages participants to ride bikes, make friends, and celebrate their city.